Preserving Cultural Heritage, Encouraging Artistic Innovation, Creating Unity through Diversity. 70 years ago, the founders of International Theatre Institute ITI envisaged ITI a platform for international exchange and for the education of the performing arts, as well as using the performing arts for mutual understanding and peace. This vison of ITI has not changed ever since. With the great support from all the ITI family members in the past 70 years, ITI has now developed into the world’s largest organization for the performing arts. To commemorate this special milestone, ITI has decided to christen 2018 as “the Year of ITI” and express the gratitude to all the people who support the development of ITI and more importantly, the development of performing arts. 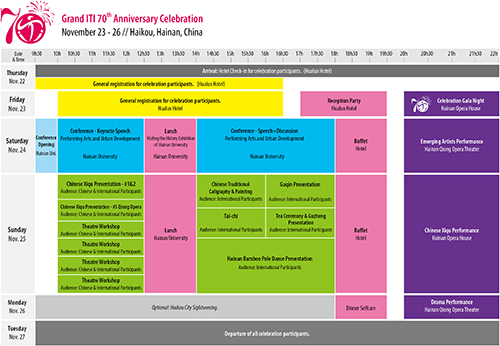 ITI’s Grand 70th Anniversary Event in Hainan, China, will grant a platform to esteemed guests from the world of the performing arts to gather and exchange. The goal of the event is to create a rich environment for discussion through its educational events, such as workshops and presentations, as well as its top-class artistic performances. These activities are intended to inspire, enlighten and galvanise those present, encouraging them to fortify their efforts for the benefit of the performing arts. If you want to >>download the programme please click here.